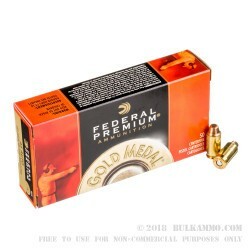 Federal Premium has been one of the leading brands in the competitive shooting sector since 1922 due to their top-tier component selection and reliable function. 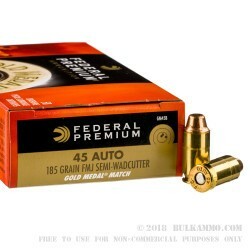 Their match-grade Gold Medal line is especially sought after due to greater inspection and projectile selection time spared during the manufacturing process. These .45 Auto rounds are no exception and have been built from the ground up with IPSC, Bullseye, and other shooting sports in mind. Each round features a 185-grain full metal jacket (FMJ) projectile with a semi-wadcutter (SWC) shape. The relatively light weight of the bullet allows for a smaller powder charge, resulting in controllable recoil for simple sight reacquisition and fast followup shots. 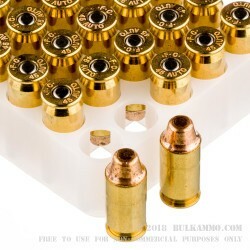 This style of .45 ACP load is also highly popular for use in custom 1911s with lighter springs and polished friction surfaces. The SWC shape bears a slightly rounded nose for clean feeding with a slanted ogive and flat shoulder that makes clean, circular-cut holes in targets; this classic means of target penetration makes hits easier to count and can even increase a shooter's score in the case of shots that barely break the border of perforated scoring zones. 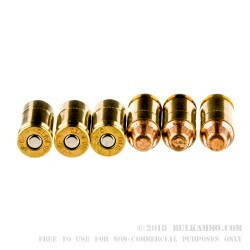 Each bullet is loaded into a reloadable brass casing where it is preventing from sliding rearwards by a light base crimp; this not only preserves accuracy, but prevents setback from causing a dud round, squib, or catastrophic failure. As part of the gold medal line, the brass casing has been checked over thoroughly for proper wall thickness, a burr-free surface, and a correct flash channel before being mounted with a non-corrosive Boxer primer.